Last night I attended an organic fundraising dinner for the Children’s Eternal Rainforest. The forest is in Costa Rica, and is surrounded by land which has been logged. Last night’s dinner at CAA in Los Angeles was to raise money to buy some of the cleared land surrounding the forest in order to replant it, growing the rainforest. The evening was organised by Sara Newmark from New Chapter Organics. 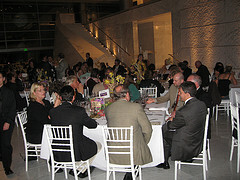 The food for this event was organic, with all the ingredients provided by Whole Foods. There was a roasted fig salad with asiago cheese, followed by a choice of either brick roasted chicken with chestnut stuffing or vegetable tian with couscous and grilled vegetables. Dessert was pastel de leche, a Mexican-style sponge cake soaked in a lime cream sauce, with fresh strawberries on the side. Cocktails included a fabulous ‘acai martini’ made from Bossa Nova acai juice and VeeV vodka, a new spirit made from acai berries. I organised the music, playing electric violin in the main room, with my friend David Starfire DJ’ing after dinner. In 1987, a classroom of young children in Sweden decided to take action to protect endangered rainforest. They creatively staged fundraisers, such as puppet shows, pony rides and bake sales. The Swedish government matched their earnings, and in less than two years they raised enough money to buy 3,000 acres in Costa Rica. Today, the Children’s Eternal Rainforest is the largest private reserve in Central America, protecting 54,000 acres. Children from 44 countries around the world have contributed to its protection. It is managed by a Costa Rican nonprofit organization called the Monteverde Conservation League, and in 2002 the Monteverde Conservation League US was formed as the US charity to support the Children’s Eternal Rainforest. Because rainforests are so important in storing carbon, providing habitat for migrating species, moderating global climate change, creating oxygen, and are the home of half of the biodiverity on the planet, we have every reason to protect them. Moreover, because humans are responsible for the devastating deforestation, we feel it is right to also be responsible for protecting rainforests and the species that make the forests their home. Unfortunately, people continue to slash and burn rainforest at an estimated rate of an acre every second, or approximately 30,000,000 acres a year. The goal of the Monteverde Conservation League US is to raise money to buy and reforest parcels of land that stretch down the mountains toward the Pacific Ocean so that altitudinal migrating animals such as monkeys and leopards will have food year-round, the rich biodiversity of this region will be protected, and generations to come can benefit from a protected ecosystem.